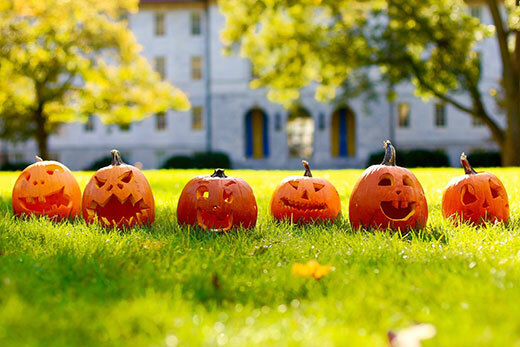 Whether you're in the mood for a gory "rock 'n' roll nightmare" about Dracula or just want to enjoy "spooky doughnuts" and other treats, Emory's Halloween events have you covered. You can also see "spooktacular" student art, view mummies with a side of either mixers or milkshakes, get chased by zombies and even learn the story behind the real cemetery on campus. • “The Anointing of Dracula: A Grand Guignol” is Theater Emory’s offering for Halloween. Performances are scheduled for Oct. 26-29, Oct. 31 and Nov. 2-5 at 7:30 p.m. in the Mary Gray Munroe Theater, with special 11 p.m. showings Oct. 28 and Nov. 4. Written and directed by Brent Glenn, Theater Emory's new artistic director, and inspired by the works of Bram Stoker and others, this is described as a “blood-drenched rock 'n' roll nightmare based on the original Dracula.” It features strobe lighting, gunshots and water-based haze with “extreme bloody carnage and overt sensuality,” recommended for mature audiences only. Don't miss these spooky specials: On Oct. 31, it’s pay-what-you-wish at the door only. If you come dressed in costume on Halloween, you get in free. Free admission is also available for door sales at the 11 p.m. performances on Oct. 28 and Nov. 4. This deal is subject to availability. A free special event will also be held on Halloween. Prior to the Oct. 31 performance, Dacre Stoker will lecture in Harland Cinema on his Great Grand Uncle Bram Stoker's novel. • The Halloween Spooktacular Art Showcase, hosted by the Media, Literature, Arts Outreach (MLAO) House, promises yummy treats and scary art from 6 p.m. to 8 p.m. The event is free and open to the public. MLAO House is located at 14 Eagle Row. • Mummies & Mixers, a monster smash hit last year, is back from 7:30 p.m. to 10:30 p.m. in the Michael C. Carlos Museum's Ackerman Hall. This year’s event features music, costumes, a classic mummy movie from 1940 and tastes from Atlanta's favorite caterers, plus three specialty cocktails crafted by Julian Goglia of The Mercury, The Pinewood Tippling Room and Proof Cocktail Syrups. Wear your costume. Tickets are $30 for museum members; $35 for Emory alumni, students, faculty and staff; and $40 general admission. You can buy raffle tickets for $10 to win prizes. • Haunted Harris, Emory's very own campus haunted house, returns from 7 p.m. to 9 p.m. This signature event, organized by the resident advisers of Harris Hall and the Complex in collaboration with Late Night at Emory, consists of four haunted rooms within Harris and the Complex. Once you walk through the Complex Courtyard where the experience ends, enjoy Halloween-themed refreshments from Emory Dining. All guests must be accompanied by an Emory faculty, staff or student; IDs will be checked. Haunted Harris draws over 300 participants each year. For more information, contact Des’mon Taylor. • Campus Life doesn’t believe you’re too old to go trick-or-treating. On Friday from 2-4 p.m., students will have the opportunity to visit the various offices in the Alumni Memorial University Center (AMUC) to get candy and information about the programs, services and events that occur in the building. “Come by on and see what tricks the AMUC has up its sleeves!” says Kayla Tyson, Campus Life coordinator. • Be part of the “Running Dead” by coming out to GlobeMed's 5th Annual Zombie 5K from 10 a.m. to 12 p.m. The run starts at the Student Activity and Academic Center on the Clairmont Campus. As runners make their way through Lullwater Preserve, they have to avoid ferocious zombies that come out at this time of year. As a reward for survival, there will be food, prizes and medals at the end. Tickets are $20. All proceeds go directly to the Migrant Assistance Program in Thailand. For more information, contact Meg Walters. • Also on Saturday, bring the kids in your life to the popular Mummies & Milkshakes. The 12th annual event will be from 6 p.m. to 9 p.m. at the Carlos Museum in Ackerman Hall and the Egyptian galleries. This event is free to Carlos Museum members and children ages 5 and under; $5 for non-members. Register here. • Undergraduate students can take a stab at writing Horror Haiku from 3-6 p.m. at Woodruff Library in Room 217. Submit your poem about Frankenstein or Halloween for the chance to win a prize. The event is sponsored by Woodruff Library and the Emory Integrity Project. • Cider, snacks and ghosts — it’s the complete package for a tour of the Hardman Cemetery on Clairmont Campus. Gary Hauk, Emory University historian and senior adviser to the president, guides participants through history of this burial ground on Halloween beginning at 6:30 p.m. just as the dark is setting in. The adventure is free and open to all.